Choosing the right logging configuration can make the difference between finding a performance issue during development or suffering from it on production. But it can also create an overhead that slows down your application. You need to decide which information you need and configure your system accordingly. A development configuration which logs enough internal information to understand the database interactions, see the number of executed queries and check the SQL statements. A production configuration which avoids any overhead by logging as few messages as possible. You only need to add your preferred framework to the classpath, and the JBoss Logging library will pick it up. If there are multiple frameworks available, the one with the highest priority will be chosen. I prefer log4j 2 and will use it for the examples in this post. The concepts and log categories are the same for all frameworks, but the format of the configuration file and the names of the log level can differ. I will show a few different configuration files in this article. Please check the documentation of your logging framework, if yours is not included. As all applications and frameworks, Hibernate writes log messages in different categories and log levels. org.hibernate This category contains all messages written by Hibernate. 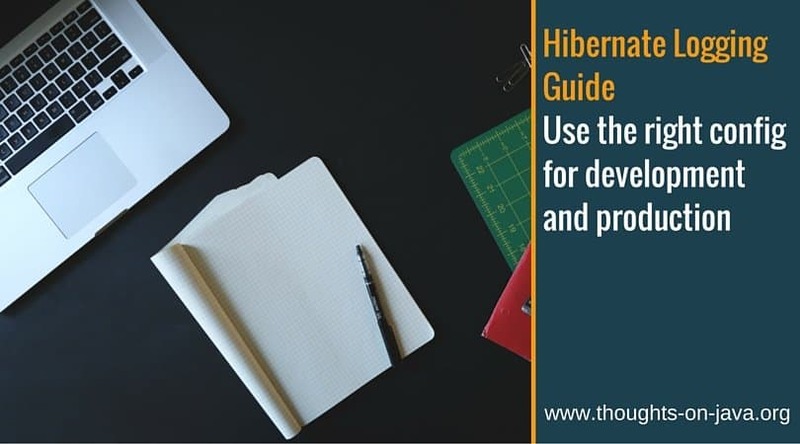 You can use this to analyze unspecific issues or to find categories used by Hibernate. Be careful, setting this category to a fine log level might create a lot of log output. org.hibernate.SQL All SQL statements executed via JDBC are written to this log category. You can use it together with org.hibernate.type.descriptor.sql to get more information about the JDBC parameters and results. org.hibernate.type.descriptor.sql Hibernate writes the values bound to the JDBC parameters and extracted from the JDBC results to this log category. This category should be used together with org.hibernate.SQL to also log the SQL statements. org.hibernate.pretty Hibernate logs the state at flush time of max. 20 entities to this log category. org.hibernate.cache Information about second level cache activities is written to this log category. org.hibernate.stat Hibernate writes some statistics for each query to this category. The statistics need to be activated separately (see Activate Hibernate Statistics). org.hibernate.hql.internal.ast.AST This category groups the HQL and SQL ASTs during query parsing. org.hibernate.tool.hbm2ddl Hibernate writes the DDL SQL queries executed during schema migration to this log category. The names of the log levels are defined by your logging framework and define the amount and granularity of the log messages. You can assign a log level to each category. If you do not specify a log level for a specific category, it will inherit the level from its parent category. How to get Hibernate to log the executed SQL queries is an often asked question, and the most popular answer on the internet seems to be to set the show_sql parameter in the persistence.xml to true. But please, don’t do this! Hibernate writes all executed SQL statements to standard out without using the logging framework. Therefore, it becomes difficult to define the log file which shall contain these specific log messages. Writing to standard out is also most often much slower than using an optimized logging framework. The persistence.xml is part of a jar file of your application, and you need to open that binary if you want to activate or deactivate the logging of the SQL statements. The configuration of your logging framework is most often an external text file that can be easily changed on any system. The better way to activate the logging of executed SQL statements is to set the log level of the org.hibernate.SQL category to DEBUG (or the corresponding log level of your log framework). Hibernate will write the SQL statements without any information about the values bound to the JDBC parameters or extracted from the query result. If you also want to get this information, you have to set the log level of org.hibernate.type.descriptor.sql to DEBUG (see the development recommendation for an example). 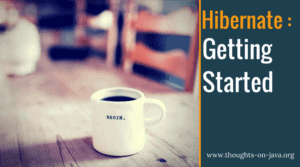 Hibernate is doing a lot of things for you in the background, and that makes it easy to forget that you are still working with a database. But if you want to make sure that your application will perform as you expected, you need to check the number of executed queries and their SQL statements. To get this information, you need to set the log level for the org.hibernate.SQL category to DEBUG, and if you also want to log the used bind parameter values, you also need to set the org.hibernate.type.descriptor.sql category to trace. In addition to that, I prefer to activate Hibernate statistics to get a summary of the most critical metrics at the end of each session. In the following sections, you can see such a logging configuration for different logging frameworks. If you use any of these configurations, Hibernate will write a log file that looks very similar to the following one. It was written by log4j, and it shows the Hibernate messages for a session in which I persisted 2 new Author entities, updated one of them afterward and selected all Authors with a given last name. 13:45:21,488 DEBUG [org.hibernate.SQL] - update Author set firstName=?, lastName=?, version=? where id=? and version=? 13:45:21,522 DEBUG [org.hibernate.SQL] - select author0_.id as id1_0_, author0_.firstName as firstNam2_0_, author0_.lastName as lastName3_0_, author0_.version as version4_0_ from Author author0_ where author0_.lastName=? If you don’t need that many information, I recommend starting with removing the configuration of the org.hibernate.type.descriptor.sql category. This will remove the log messages showing the bind parameter values. As you can see in the log file, these are the majority of the written log messages and there are so many of them that the log gets hard read. As long as you do not need to analyze an issue in production, you should log as less information as possible. This can be done by setting all Hibernate related log categories to ERROR. You should also make sure that the Hibernate statistics component is deactivated. Hibernate supports several logging providers and you can pick the one you prefer by adding it to the classpath of your application. The log messages are grouped into different categories, and you can activate or deactivate them by assigning a log level for each category. Writing log messages and collecting the required information takes some time. You should, therefore, switch off all unnecessary log messages in your production configuration. The development configuration should activate debug logging for some crucial categories like org.hibernate.SQL and I most often also activate Hibernate statistics to find potential performance issues as soon as possible. If you like to learn more about finding and solving Hibernate related performance issues, have a look at my Hibernate Performance Tuning Training. Thanks. Read the blog and removed show_sql with the mentioned log levels. Thanks. Did you read this blog post that they faced with enabling debug log caused performance problem? yes, I saw that post. I can understand the general idea behind that behaviour but most Hibernate users will not expect it. I think an additional property to activate the extra statements would be a good idea. The Hibernate is discussing this issue on their mailing list. Seems like we get a fix for that in the future. Until then you should use the ERROR log level in production to avoid it. Thank you. But despite my hard efforts. It’s not working on my Payara 5.